Our Leadership Quiz: 10 Key Questions tool is a perfect exercise for leaders to conduct a quality self-assessment and determine how he or she is perceived in the minds of their team members. Employees need just a few simple things in order to be happy in their jobs. As a leader, you need to know whether or not you are meeting the primary needs of your team. Managers who can answer in the affirmative to the majority of the ten questions posed in our leadership quiz will experience a more productive workforce and higher employee retention. Business organizations whose leaders rate highly on these 10 Key Questions exercise, benefit greatly through a higher degree of customer satisfaction and bottom-line profits. Leaders must understand that without first satisfying an employee’s basic needs, you cannot expect team members to produce at the highest level of performance. A thoughtful leader will take the time self-check, and ensure that the needs of the team are being catered to. They do not do this because they are out to win a popularity contest. Rather, they do it because it's the right thing to do - for the employee, the organization and even the shareholders. "For the most part people don't quit companies, they quit their manager. Usually an employee departure could have been avoided if the leader had only asked a few key questions." Your team members' basic needs include knowing what is expected of them at work; knowing they have access to the proper leadership tools, equipment and support to do their work correctly, and being able to answer basic questions of self-worth and professional value to the team and the organization. As the leader, you hold great influence over helping your team members to answer these important questions. The 10 Key Questions leadership quiz will assist you in identifying the areas that are important for you to properly lead and support your team. If you can answer Yes to each of the questions then you are definitely on the right track. However, if you answer is No, or you just aren't sure how to answer each question, then you have some important work to do in that area(s). The good news, however, is that you can turn each No into a Yes fairly quickly if you commit yourself to the challenge. "Ask questions. Growth is fueled by desire and being actively engaged. Imagine yourself learning throughout your life at the rate of an infant." 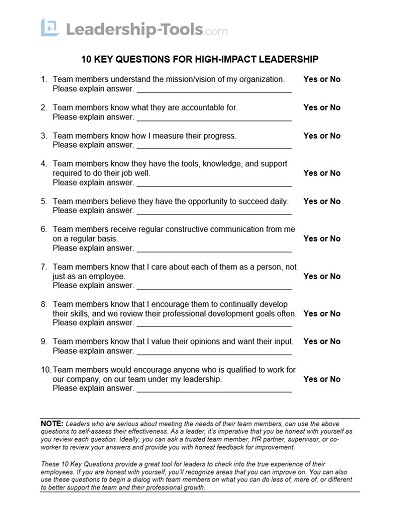 Using the 10 Key Questions leadership quiz you can quickly assess how well you are doing as a leader to ensure your team members have clarity on key areas of accountability and performance. Team members understand the mission/vision of my organization? Depending on the size of your organization you may or may not have a formalized mission or vision statement. However, even if you don't have a mission statement established, you can use this to your advantage. Creating a mission statement for your team can be a powerful exercise that you can lead your team through during your next team meeting. We've provided mission statement tools and mission statement examples to assist you in this effort. Team members know that I encourage them to continually develop their skills, and we review their professional development goals often. Maintaining open, direct and frequent communication with your team members is critical to your success and the success of your team. Depending on the size of your team, you should schedule regular one-on-one discussions on a weekly or monthly basis. You can always cancel a meeting if you both feel a meeting isn't warranted, but if you don't have it scheduled the chances of meeting are greatly diminished. Not sure what to discuss? For starters you can go through several of the questions on our leadership quiz. Ask your employees for direct feedback to let them know that they're satisfaction is important to you. You can also leverage tools in our leadership library such as our 360 degree Leadership Analysis tool; the Performance Appraisal tool can also help guide your discussion to address key areas of performance, and don't forget our Succession Planning tool, which is meaningful to any team member who aspires to move up within the organization. Team members receive regular constructive communication from me on a regular basis? Communication doesn't always have to be in a formal setting to be effective. Connecting with your employees on a personal level is important for gaining trust and loyalty. Rewarding and recognizing your people, providing positive reinforcement for a job well done goes a long way to show the employee that you value them and that you appreciate their efforts. Tools that can assist you in this effort include our My Favorite Things tool and remember that you can also use our free Leadership Ecard system for quick and easy employee recognition. As you can see by the three questions we've already addressed in the leadership quiz, you have all the tools and resources you need in our leadership library to help you to be an outstanding leader. We encourage you to download the free 10 Key Questions leadership quiz and begin planning how to address each of these important questions. With just a little extra effort you can set a powerful example for your team; gain employee buy-in; improve employee retention, and earn credibility as a trusted and effective leader. 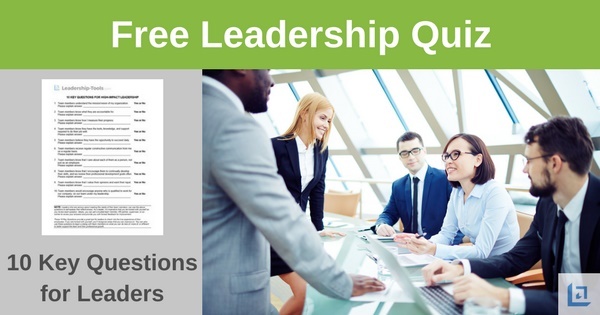 To download our free leadership quiz 10 Key Questions tool, simply subscribe to our free newsletter. You will immediately receive a password that grants access to our entire leadership tools library.